Vision Aids is one of few stores in Canada that sell a wide variety of vision aid products. It sells a big selection of magnifiers that range from $20 to $700; writing aids and specially-lined booklets, along with special markers and other stationery designed for the visually impaired and those afflicted with Parkinson’s disease. Add to that, there are also entertainment products such as braille BINGO cards and playing cards, which are extremely popular among the senior community. Products such as talking watches, talking scales, and contrast-enhancing eyewear can go a long way in bettering people’s lives. 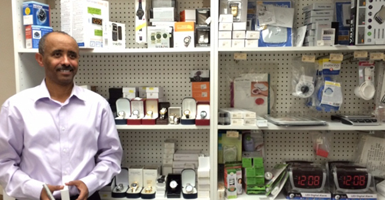 Iyasu has many clients from the CNIB and he makes weekly visits to senior homes and attends trade shows. He teaches his clients everything from how to use a cane to how to cook. A graduate in computer studies, Iyasu started his career designing software and hardware for the blind. “In the beginning, it was just a job. Now it is a passion. ”When the previous owner of Vision Aids was ready to retire ten years ago, Iyasu jumped at the opportunity to take it over.